been regarded as secondary to defence’s main role and has been delivered mainly using whatever spare capacity and resources could be obtained. The launch of the International Defence Engagement Strategy by the Defence and Foreign Secretaries in 2013 signalled the higher priority government gave to the use of defence as part of an integrated approach to meet our wider international objectives. To support the strategy, the MOD created a framework for delivering defence engagement by introducing: a comprehensive framework of prioritisation and governance for better targeting of resources; a system of monitoring and evaluation to judge outcomes against inputs; a range of regional strategies and plans within defence that are integrated with National Security Council strategies; and mechanisms to determine the priority given to defence engagement compared to operations and contingency. We will make defence engagement a funded, core Ministry of Defence (MOD) task for the first time, meaning that the Armed Forces will prioritise defence engagement alongside other core tasks. Significantly, this gives higher and formal status to defence’s role in shaping the international environment; building stability through helping to prevent, manage and recover from conflict and crises; building the capacity of partners to respond to security challenges; and in promoting and delivering our prosperity objectives. The SDSR set out the Government’s intention to work ever more closely with allies and partners to achieve its vision. The subsequent UK decision to leave the European Union (EU) reinforces the need for the UK to remain engaged in the world to promote its interests and values, though how we do this may have to change. This new approach will need to include redesigning the relationship with the EU Common Foreign and Security Policy (CFSP) and Common Security and Defence Policy (CSDP), and strengthening other multilateral groupings and bilateral relations within and beyond Europe. Defence engagement covers a broad range of activities, contributing to all three of our National Security Objectives: protecting our people; projecting our global influence; and promoting our prosperity. It encompasses a mixture of responses to immediate short-term challenges and longer-term development of relationships or capabilities. Most defence engagement activities contribute to a range of objectives. For example, during 2015, troops from the Indian Army trained alongside British Army soldiers on Salisbury Plain in Exercise Ajeya Warrior. This had an immediate aim - to enhance the ability to work together on counter-insurgency and counter-terrorism operations. It also had a longer-term objective, to build and promote positive military relations between the Indian and British armies. The influence that defence can exercise comes from our ‘hard’ military power, and defence engagement activities are often conducted alongside or as part of military operations. An instance of this was the deployment of RAF Typhoon aircraft to Estonia from April to August 2016. This was part of NATO’s enhanced Baltic Air Policing mission to secure the skies above the Baltic states. This is the third consecutive year that the UK has committed aircraft to Baltic Air Policing, underlining our commitment to the sovereignty of the democratic nations of Eastern Europe. RAF Typhoon at Amari Air Base in Estonia. At the same time, we have also joined the multinational Trans-Atlantic Capability Enhancement and Training initiative, under which we are deploying short-term training teams to Estonia, Latvia, Lithuania and Poland to help build the capacity of national forces. Similarly, in Ukraine, we have trained over 2,000 members of the Ukrainian Armed Forces, and are aiming to provide additional support to Ukrainian defence reform, including practical interventions in areas such as strategic communication and the modernisation of procurement and logistic systems. Much of this engagement takes place within the framework of established alliances and partnerships, particularly within NATO, which remains the bedrock of our defence. The UK maintains contingent forces for combat as part of NATO and multi- laterally, through the Joint Expeditionary Force (JEF), with Denmark, Estonia, Latvia, Lithuania, the Netherlands and Norway. All three armed services participate in regular exercises with a range of international partners, including Australia, Malaysia, New Zealand and Singapore, in the context of the Five Powers Defence Arrangement. 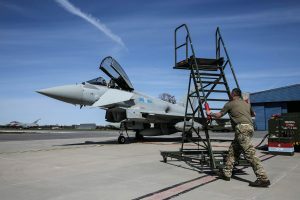 In a more inter-connected world, UK personnel are increasingly employed in defence engagement tasks beyond the Euro-Atlantic Zone to help tackle some of the most urgent challenges to international security. Reflecting this, the Army has aligned individual brigades to specific regions around the globe. For example, 7 Infantry Brigade is aligned to West Africa, and personnel from the brigade have been deployed to help train Nigerian troops who will conduct operations against Boko Haram militants. Our package of support to Nigeria also encompasses work with Nigerian defence training establishments, contributing to longer-term capacity building as part of our enduring defence relationship. Through defence engagement, we provide a range of assistance and support tailored to the particular interests and needs of our international partners. For example, HMS Severn deployed to the Caribbean in 2015 for Exercise Trade Winds. This built the capability of Caribbean nations to respond more effectively to natural disasters, as well as to a range of land and maritime threats, including illicit trafficking. Defence engagement can also contribute directly or indirectly to promoting prosperity. Take the charting of coastal waters carried out by the UK Hydrographic Office, which can act as an important facilitator to international navigation and trade. At the Commonwealth Heads of Government meeting in November 2015, the UK announced significant additional support in this area to small developing island states. The SDSR made support for defence exports a core task for the MOD, recognising the importance to our own security and prosperity of sustaining the defence industry. Defence assets can provide direct support to responsible export campaigns, such as the presence at the Seoul International Aerospace and Defence Exhibition in October 2015 of an RAF A400M transport aircraft and the RAF Falcons parachute display team. Much of this activity is delivered using military assets and personnel, but civil servants have an important part to play. At the centre of the MOD, they work alongside military colleagues in devising our strategic approach to defence engagement and developing regional priorities and programmes, co- ordinating with colleagues across government, particularly the Foreign & Commonwealth Office, the Department for International Development, and the Home Office. Civil servants, often those working as part of the Stabilisation Unit, are also engaged in direct delivery of defence engagement activity, for example in supporting security sector reform and capacity building. 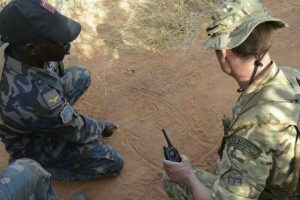 They are also deployed as permanent defence advisers and embedded in a number of partner countries. The importance of the role played by civil servants is reflected in MOD plans to increase their involvement in delivering Defence Engagement abroad. As announced in the SDSR, the department is developing new mechanisms for identifying and managing personnel, both military and civilian, with the skills and experience to contribute to defence engagement activity. This includes establishing an Armed Forces Defence Engagement career stream. We are also exploring ways to make better use of reservists in the delivery of this engagement, exploiting their civilian skills where appropriate. Maintaining effective defence networks is a key enabler for all defence engagement activity, and the SDSR announced enhancements to defence networks that the MOD is now putting in place. It established a new defence attaché position in Finland and is establishing others in Albania and Senegal. Existing defence sections, including in Japan, Qatar and the Baltic States, will be reinforced over the next 12 months. Additionally in 2016, new British Defence Staff organisations will be established in the Middle East, Africa and the Asia-Pacific region. A new Defence Attaché and Loan Service Centre is already in place at the UK Defence Academy to better train, prepare and administer Defence Section and Loan Service personnel. A key element of defence engagement is the provision of International Defence Training. UK military training is highly regarded and much in demand. The SDSR announced our intention to increase the training we offer to international partners and the support to international capacity building. The MOD has created additional places on a number of courses, including high-profile courses such as the Royal College of Defence Studies and the Advanced Command & Staff Course at the Defence Academy. The department has also launched a variety of new capacity-building initiatives, including a three-year counter-IED (Improvised Explosive Device) programme with Pakistan. Introducing the SDSR, the then Prime Minister wrote that “Britain’s safety and security depends not just on our own efforts, but on working hand in glove with our allies to deal with the common threats which face us all”. Defence engagement is a key element of that endeavour, and the MOD continues to look for ways of extending its range and improving its effectiveness. Sending troop or company sized level units globally is not really Defence Engagement.